OVERCOMING grief and still-raw pain, the family of a former Catholic schoolboy who died from an overdose at a music festival, are rallying to promote drug education and improve safety measures for young party revellers. 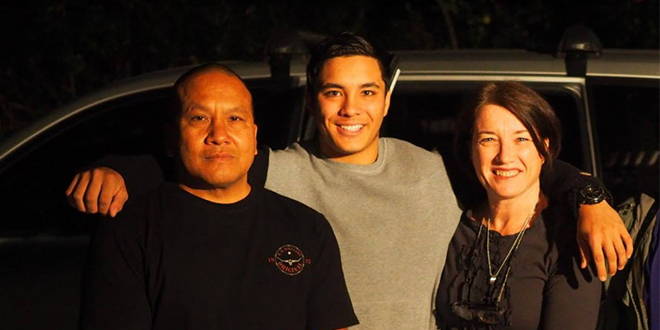 Joshua Tam, 22, a former Marist College Ashgrove student, a talented rugby player who was studying at QUT, was at the Lost Paradise music festival on the New South Wales central coast on December 29 when he died. Through a new charity “Just Mossin”, the Tam family hopes schools will enlist past students to assist “educating the next generation about the dangers of drugs and alcohol”. “In Joshua’s honour, we as a united family are devoted to helping implement positive changes in the youth community and culture, to minimise the amount of young lives lost,” the family said in a statement. On the new Just Mossin website, Joshua’s mother Julie Tam has spoken out about her life-changing tragedy. “On Boxing Day 2018 my husband and I left for our annual Christmas holiday at the beach,” she wrote. “I kissed my beautiful son goodbye as usual, much to his disgust, and said drive safe to the festival, it’s a long drive. “He smirked and said you know mum, boys and long drives in his dark humour kind of way. “That’s something we had in common. “That’s all I was worried about. We had plenty of conversation about drugs and alcohol, we hardly needed another. “Saturday 29th December at 11.37pm I woke to a call no parent should have to receive. Who? Our son? Surely not? 1. Help establish improved safety measures, and positive party habits for young people and the community at large. 2. Design and implement smart personal safety devices (PSD’s) for revellers at festivals and events. 3. Unite a collective voice to lobby our governments to help us make a change. 4. Experienced volunteer-based peer-presented education programs for young adolescents. Joshua’s death, and the subsequent deaths of a Victorian man and a New South Wales teenager at festivals has reignited a debate about whether “pill testing” kits should be introduced at music festivals. Both the NSW and Victorian governments are opposed to the idea. NSW Premier Gladys Berejiklian said her government would consider pill testing “if there was a way in which (they) could ensure that lives were saved”. “But there is no evidence provided to the government on that,” Ms Berejiklian said. The Queensland Government is examining a trial of test devices used at Canberra’s Groovin the Moo music festival last year, although the Queensland Police Union has dismissed the idea. They measure the purity of a drug and, in some cases, contaminants.